Let fall here and now an oceanic rain of virtue and goodness! Is a distinguishing feature of the Glorious Able Ones themselves! As Teachers of the Dharma are uniquely wonderful! Beautifying the tower of scriptural and realization Buddhadharma! I make requests to that Supreme Guide of Beings! May you remain firm as the Lord of Beings! Clearing darkness of ignorance of the three realms! Leads Tibetans to a new springtime of perfection! With all spontaneously perfected qualities of supreme wisdom, morality and compassion! All Dharmic wishes of infinite beings be effortlessly accomplished! To set all these beings in temporary and everlasting happiness! May all these prayers be accomplished without obstruction! This prayer for the Tenth Supreme Incarnation of the Omniscient Panchen Lama, root of benefit and happiness, Tenzin Gedun Yeshe Trinle Puntsog Pel Zangpo [Gedun Ch�kyi Nyima], to remain firmly in our world as the fully enlightened Nirmanakaya, immutable Vajradharma, and for his activities benefit to the teachings and beings to increase like the waxing moon, is by the Shakya Monk, Holder of the Lotus, Tenzin Gyatso [the Fourteenth Dalai Lama]. It is sent forth from India, Land of the Aryas, with great faith, aspiration and altruism. May all be auspicious! English translation from Tibetan by David Molk, January 1, 1999. 1. Right-mouse-click on the link. 2. Select 'Save Target As' (Internet Explorer) or 'Save Link As' (Netscape). 3. Save the document as a document file to your hard drive. Note: If you're using Internet Explorer, enter .doc at the end of the file name and then select 'All Files' for the file type. Please feel free to share this prayer with others! 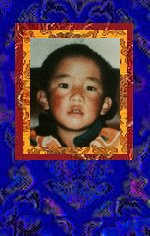 Interested in working to free the young Panchen Lama? The English version of this prayer was translated by David Molk (U.S.A.). The translation was sponsored by Julia Milton (Canada). Special thanks to Samdup Tsering and Damien Busby (Australia) for providing the original Tibetan text and the Tibetan transliteration given above. May all nations be blessed by the prayers and activities of the Panchen Lamas of the three times!